Is there a drummer on the planet more famous than Questlove? In hip-hop, probably not. Famous for all the right reasons (talent, intelligence, body of work), the artist born Ahmir Thompson is the coolest nerd in the game. With a knowledge of music comparable to Nardwuar, and skills on the drum set comparable to no one, Questlove is somewhat of a living legend. His group The Roots (first off, when has a drummer who isn’t the singer ever been a band’s frontman?!?!?!) has released eleven critically acclaimed studio albums. In addition to their recorded music, the Roots are currently the house band for The Tonight Show Starring Jimmy Fallon, a partnership so forward-thinking, we’re not sure which party has benefitted more. Thompson is also one of the co-founders of The Soulquarians, the neo-soul collective that basically invented neo-soul. Other members of this disgustingly talented group of artists include Common, Q-Tip, Erykah Badu and the late J-Dilla. 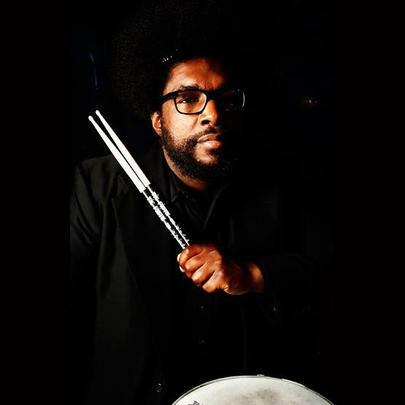 To sum up a person who cannot be summed up: when Questlove drums, we listen, and when he speaks, we listen harder. One.